Luther Pendragon is a London-based crisis communication and lobbying company and the European affiliate of Nichols-Dezenhall. According to the Nichols-Dezenhall website, Nichols-Dezenhall "helps manage Luther Pendragon's clients in the U.S., while Luther Pendragon helps Nichols-Dezenhall battle crises in Europe. The affiliation also gives Nichols Dezenhall access to top-flight resources in Germany and Belgium". In September 2005, PR Week reported that "managing partner Simon Whale and partners Gina Coladangelo, Daniel Guthrie and Amy Kroviak have joined forces to take control from founders George Pitcher and Charles Stewart Smith. The pair started Luther in 1991 and between them own 75 per cent." In February 2008, it emerged that Luther Pendragon was one of three agencies refusing to join the Association of Professional Political Consultants (APPC), following a committee inquiry chaired by Labour MP Tony Wright. Despite attempting to "make amends" by drawing up its own code of conduct, the controversy surrounding Luther Pendragon's steadfast refusal to register resulted in a representative being called in to give evidence to MPs at the Public Administration Select Committee. 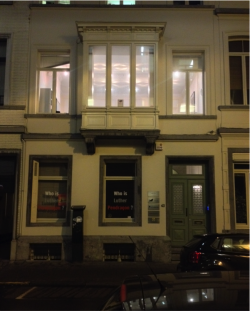 In 2009, Luther Pendragon opened their Brussels office that is headed by former MEP Mark Watts. Explaining new recruits as Oliver Kaye, Mark Simpson, and Rose Montgomery with EP backgrounds, Watts said, "Regulation is now back in fashion in a big way and we know Brussels will be seeking to regulate almost every sector in 2010. Luther is advising clients that 2010 will be the ‘Year of EU Regulation’." He added: "The background of Luther’s new team reflects the post-Lisbon reality. The European Parliament is now the key institution and our understanding of what makes the Parliament tick is second to none." In August 2005, the Committee on Radioactive Waste Management (CoRWM) hired Luther Pendragon "to advise on communication issues arising from the third phase of the Committee's public and stakeholder engagement process". According to CoRWM, "Luther Pendragon has been retained to support the process of consultation which will inform CoRWM's final recommendations, due to be presented to government in 2006. The Luther team will comprise: Adam Lewis, Ben Rich, Mike Granatt, Susie Winter and Aideen Lee. For more details see the CoRWM page. Here was an admission that CoRWM’s PR company was not contracted to CoRWM but to AMEC NNC, a nuclear company. The CoRWM section reveals how it was up to AMEC NNC and Luther as to what information was released rather than Defra officials. "We estimate that it will take a consultant around 7 hours in total. As per the contract this time is charged at £200 per hour bringing it to a total of £1400." "this is ridiculously expensive, please can you check urgently with defra FOI people whether we have to spend this kind of money as a result of their 'advice.'" In the end, sources from CoRWM have told NuclearSpin that the money was not paid. Luther Pendragon has lobbied for a number of clients involved in the education industry. Paradigm Trust, a multi-academy trust of primary schools in East London. STEM Academy Educational Trust, an academy sponsor specialising in STEM-related education provision. It opened its first school in 2014, STEM Academy Tech City (a 6th form college just off Silicon Roundabout). It decided to join the Aspirations Academies Trust from September 2015 and rename the college Tech City College. International Schools Partnership; an international schools group (aiming to rival market leaders like GEMS and Nord Anglia). ISP is led by Ryan Robson, a founder of Sovereign Capital. Mark Watts, director and co-founder. Former MEP for the Labour Party for Kent East and the South East of England. Oliver Kaye, director and co-founder. Is also Secretary at PSI Alliance. Mike Granatt, formerly Michael Martin's media adviser, however resigned claiming he had been misled with regards to the scandal involving the former Speaker's expenses. Ben Rich, left in 2007 to establish his own consultancy: Ben Rich Associates. Andrew Sharkey, has since worked for Cohn & Wolfe, Polhill Communications then Redleaf Polhill and Smithfield Consultants. Now Business Development Director, UK at Murray Consultants. Sue Youngman, has since worked for Better Regulation Task Force and Commission, The Risk and Regulation Advisory Council, Civil Aviation Authority, HTI and Technology Strategy Board. Is currently a consultant for Regulatory Policy Committee and The Whitehall & Industry Group and principal at Compass Rose & Co.
Jonathan McShane, is cabinet member for Health, Social Care & Culture in Hackney and chair of the Public Health System Group Public Health England. Alex Burnett, currently Global Gas Advocacy Manager, Royal Dutch Shell. Hannah Marriott, "DNA firm calls in Luther over Blunkett scandal", PR Week, 03 November 2005. (Sub req'd). Luther Pendragon, Clients, accessed 01 February 2007. Luther Pendragon, Clients, accessed 01 February 2009. Nichols Dezenhall, Luther Pendragon, Web Archive 20 December 2003, accessed 11 January 2010. PR Week, "Luther Pendragon quartet poised for £11m buyout," 09 September 2005, accessed 11 January 2010. Public Affairs News, "Luther Pendragon hires ex-EP advisers as it grows Brussels office," Undated, accessed 11 January 2010. ↑ Nichols Dezenhall, Luther Pendragon, Web Archive 20 December 2003, accessed 11 January 2010. ↑ PR Week, "Luther Pendragon quartet poised for £11m buyout," 09 September 2005, accessed 11 January 2010. ↑ Public Affairs News, "Luther Pendragon hires ex-EP advisers as it grows Brussels office," Undated, accessed 11 January 2010. ↑ CoRWM, Luther Pendragon to advise CoRWM, Press Release, 28 July 2005. ↑ Luther Pendragon, Clients, accessed 01 February 2009. ↑ Luther Pendragon, Clients, accessed 01 February 2007. This page was last modified on 21 August 2017, at 01:09.